Modified calibre 11 ¼''' BE-93-2AE automatic chronometer with 42-hour power reserve and GMT. 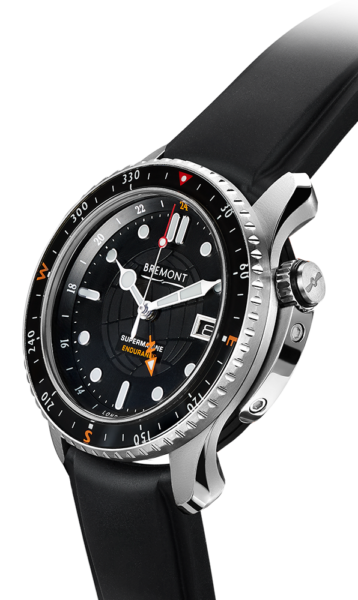 Satin and polished titanium with bi-directional rotating compass bezel with Super-LumiNova®. Water resistant to 50 ATM, 500 metres. Orange NATO strap with additional rubber Temple Island strap. Limited to 300 pieces. Named in honour of Shackleton’s most famous expedition - one which saw him rescue his entire crew after his ship ‘Endurance’ was crushed in the sea ice - the route of which Ben was retracing solo, the name is of course also a nod to the company maxim of being ‘Tested Beyond Endurance’. Shackleton getting his men back alive is one of the greatest stories of human endeavour and leadership, qualities Ben has certainly demonstrated over his twelve expeditions in the polar regions, having covered more than 7,000km north of the Arctic circle and South of the Antarctic circle since 2001. Naturally, the timepiece had to be able to withstand the extreme climate conditions of the Antarctic continent, being worn on the outside of Ben’s jacket to serve as a crucial navigational device with its GMT hand. The black dial together with its robust bi-directional rotating sapphire bezel features orange compass heading markers, complementing the North indicator on the GMT hand, all designed for ease of navigation and clarity against the stark white of Antarctica.